Ein Gedi and Qumran Caves. Negev desert Jeep trips, hiking and camel tours. Tour Price: 2 people- $560, 3-5 people- $630, 6+people- $115 each. not incl lunch $20 p.p. A desert tour in the Dead Sea area. This jeep tour covers southern Judean Desert and The Judean desert heights. Beginning at the most famous desert attraction in Israel the fortress of Masada situated on the towering cliffs overlooking the Dead Sea. We ascend Masada and explore the site before we head back off-road along the most scenic trails in the area. The breathtaking views span the Dead Sea and beyond to the mountains of Jordan. This Judean Desert jeep tour covers Masada and the natural highlights of the desert area en route. An off road jeep tour that takes in the best of the dramatic desert views spanning the Dead Sea and the Judean Desert. Departing from Jerusalem, the Dead Sea or Mitzpe Ramon, this full day desert tour gets right off the beaten track and into the heart of the Negev. Exploring the some of the areas natural highlights including 'The Small Crater' and the scenic 'Zin Valley'. The tour takes us along dramatic off-road routes into some of the best desert scenery in Israel. This tour gets off the more visited desert routes associated with the larger crater at Mitzpe Ramon and into the lesser visited scenery and more tranquil areas of the Negev and Judean Desert. Your private tour guide will share with you fascinating insights into the area's geology, ecology and of course it's remarkable history. Negev/Judean desert tour Price: 2 people- $560, 3-5 people- $630, 6+people- $115 each. not incl lunch $20 p.p. Mount Karkom is an increasingly popular site for visitors to Israel who have a particular archeological or biblical interest in the mountain. Our one day tours to Mount Karkom spend half a day exploring the mountain which is considered by some to be the biblical Mount Sinai. Owing to the long drive times the one-day tour departs very early in the morning from Mitzpe Ramon and returns late in the day. The two day tour option is a more comfortable tour choice that allows more time at Mount Karkom. It also enables us to to go off-road along desert trails to take in some of the natural highlights of the area. Mount Karkom is not always open to visitors so people requiring this particular tour should check well in advance with our office to confirm availability. Mt. Karkom tour Price 1 day tour: Up to 3 people- $750, 4- 5 people- $795 total, 6+people- $150 each. not incl lunch $20 each. Mt. Karkom tour Price 2 day tour: Up to 3 people- $1590, 4- 5 people- $460 p.p. 6+people- $395 each. All inclusive. Day 1 - Departing early morning from Mitzpe Ramon in the Negev desert, we explore the highlights of the Ramon Crater before ascending the craters steep walls on the ‘Ramon Ascent'. We drive along the edge of the crater and take in its wonderful views as we head to the Eilot Valley. In this scenic desert valley we find impressive Atlantic Pistacia trees that date back 2000 years. Our route continues on and takes us back down into the crater via Noah's ascent. By afternoon we reach the historic Spice Route where we tour a particularly scenic and fascinating stretch. At the Nekorot Valley we stop to enjoy our evening meal by the campfire and settle for the night either camping outdoors, or at the Desert Shade Khan -a traditional desert camp style accommodation (hotel accommodation is available upon request). Day 2 – Following breakfast we join the Spice Route and experience the same breathtaking views and sights as the ancient merchants who journeyed here in times long past. We visit the ruins of the Nekorot fortress and Moah. We explore the Ashosh valley whose valley walls are an unusual mix of flint and limestone. Continuing onto the Barak valley where we enjoy a short hike through the Barak canyon before heading back to the jeeps for our return journey back to Mitzpe Ramon where we end the tour. Cost includes: Guide, 4x4 Jeeps, Camping Equipment (where required), breakfast and lunch. hotel or desert camp accommodation on HB basis available at a supplemen. Day One: We explore many of the highlights of The Ramon crater entering through the Nekorot Valley on its western side. This Valley cuts through the Crater and takes in some of the best scenery in the area. The valley is where rainfall flows out of the crater during floods and it has a wealth of features associated with that including gorges, canyons and rock pools. The tour includes 4x4 adventure and some walking, we visit Mount Ardon, Mount Karbolet Haririm and the lowest point of the crater which is also the craters only natural water source, Ein Saharonim. We enjoy a short walk along the southern cliff edge of the crater's wall and enjoy the breathtaking views that span the whole of the crater from these cliffs. We exit the Ramon Crater on its eastern side following the 'Spice route', an ancient Nabatean trading route where merchants bearing wares from Asia to Europe tread on their perilous journey to the Mediterranean. This day of 4x4 and hiking includes the Ramon Crater's most dramatic scenery, its natural highlights and major historical sites. Accommodation choices include outdoor camping, desert Khan, guesthouses or hotels - according to preference. Day Two: We spend the day exploring the area's largest desert Valley, the Zin Valley. Here we experience the desert at its finest. The Zin Valley is one of the most popular choices for visitors wishing to get the best of their Negev desert experience. Its serene atmosphere and delightful views attract visitors year round. Highlights of the valley include the Ein Zik and Ein Akev desert springs. We reach the Zin Valley via Sde Boker where we stop briefly to visit the Ben Gurion memorial on the edge of the valley walls. This day can include a visit to the Avdat ruins for those with a particular interested in historic sites. This tour is an excellent year-round option especially for families. Meals: Lunch is a hearty picnic lunch in the great outdoors. Breakfast and evening meal depend on accommodation selected. This one day tour covers the best desert scenery in the Eilat area, it is a full desert experience with 4x4 off road adventure and a camel ride in the mountains by the bay of Eilat. After pick up from the hotel in open-topped jeeps we head to Wadi Shlomo for an traditional desert experience. Here we enjoy a two hour camel ride along a mountain trail before getting back into our jeeps and heading further into the mountains along an ancient pilgrim route. We drive up to the summit of one of Eilat's highest mountains, Mount Yoash, where the fabulous views span the bay of Eilat and the Red Sea coastlines of Israel, Egypt, Jordan and Saudi Arabia - all at a single glance, we also see from here the Southern Negev, the Mountains of Jordan and views across the Sinai desert in Egypt. We continue our tour down a 4x4 trail that takes us to the Netafim spring, this natural source of water attracts local wildlife and we can often see Ibex herds coming here to drink. 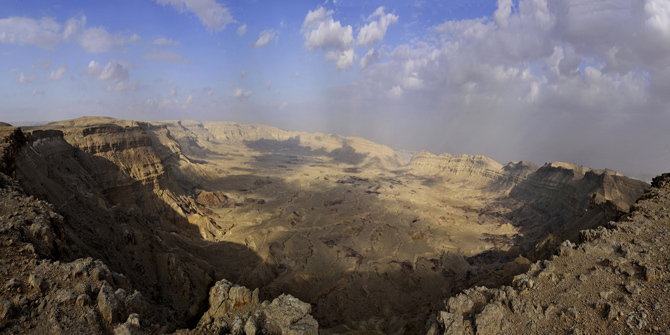 Heading deeper into the desert we visit one of the most scenic sights in the whole of the Negev, the Eteq Canyon. The views as we drive off-road to the Eteq are superb and the Eteq itself is a delightful desert canyon set against a backdrop of awe-inspiring desert scenery. The Eteq has several rock pools along its length and here too we often find wildlife as natural water sources in the Negev are relatively scarce. Back onto the trail and we drive down into the Arava Valley along a picturesque route and then the Arava road for a short drive arriving back in Eilat by evening. An outdoor picnic lunch is included in the tour price. Price of the jeep and camel tour: 2 people $560 total, 4 people $660, 5 people $730 6 people or more $139 each. Day 2- After taking in the fabulous views from the cliffs of Shaharut we make our way to the Eteq canyon, the most picturesque canyon in the area. Here we begin our descent from the Negev Plateau with the breathtaking views of the Arava Valley ahead of us. At the Eteq canyon we stop for a walk into the canyon where we see rock pools (depending on season), this too is a popular area for local wildlife and the off-road route through this area is particularly dramatic and it leads us down into the expanses of the Arava where we explore the Statues valley before making our way back to Eilat where we complete our tour. Day 1: Driving first to the Dead Sea we begin our off road desert experience on the striking cliffs overlooking the Dead Sea. We shift to 4x4 and drive to the canyon of Wadi Meshash. We leave our jeep and hike down the Meshash gorge, descending through the water holes with the help of some fixtures and fittings that aid our way. Continuing on to Wadi Muraba'at and into the Muraba'at caves. It was here that the first Bar-Kochva letters from the Roman period were found. A steep path brings us back to the 4x4 track and we begin our drive along the wild plateau landscapes of the Judean Desert, stopping occasionally at sites overlooking the Dead Sea and the oasis of Ein Gedi. After crossing the challenging canyons of Nachal Mishmar and Nachal Arugot, we set up our camp under the glittering desert skies. Day 2: Early in the morning we drive to Brekhat Zefira, a natural waterhole in the Judean Desert and from here a short 4x4 drive takes us to the Masada road. On the Roman Ramp we enter the famous ruins (King Herod's Desert Fortress) and take our time in exploring the site, hearing about its fascinating and tragic history and taking in the famous views. Back to the 4x4 for an off-road drive to the Ma'ale Yair road and back down to the Dead Sea. Following a brief 'float' in the salty waters we return to our jeep for a ride through the surreal landscape and a final leisurely hike into the Flour Cave completes our tour.